Typed carbon copy letter, signed. John Mosby to Eppa Hunton. 1909 November 18. On November 13, 1909, Archer Christian, a promising first-year halfback, suffered a fatal concussion and hemorrhage in the annual game against Georgetown. 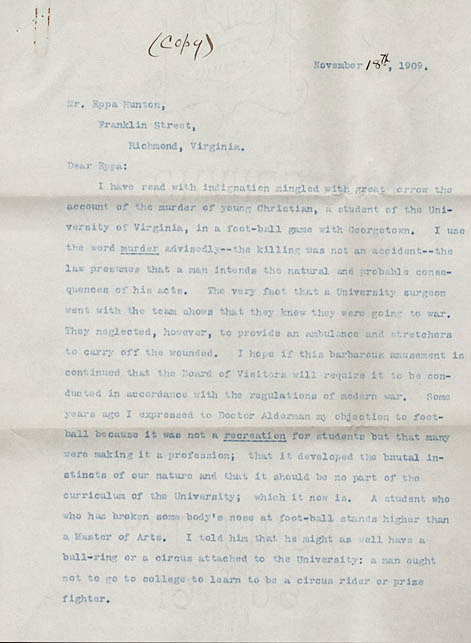 Five days later the aging John S. Mosby wrote a scathing letter to alumnus and former Visitor Eppa Hunton on the "murder" of Christian and the continuation of football, "this barbarous amusement," at the University. He denied that such sport "develops the manhood of youth....Manhood is a sense of honor and courage....Foot-ball simply develops the brute dormant in man's nature and puts the player on a level with...a polar bear. Visored Knights and tournaments were consistent with the spirit of the dark ages....But it can at least be said of the old knights that they did not shiver their lances for gate money." President Edwin A. Alderman's response was not to ban football but to reform it. He addressed a meeting of the four-year-old Intercollegiate Athletic Association in December 1909 where he urged the adoption of laws to eliminate football's dangers including Virginia athletic director William Lambeth's suggestion that the game be divided into quarters with a long rest between halves. Lambeth's proposal was approved as were suggestions to place seven men on the line of scrimmage, forbidding the "hiking" of the ball carrier and allowing the quarterback to run more than five yards beyond the line of scrimmage. Three years later the most controversial reform, a forward pass beyond the line of scrimmage, was approved by one vote. The one reform that might have saved Christian's life--helmets--was not mandated until 1939.